Roy Sutton played 224 games for Gloucester between 1947 and 1959. Small but stocky, he gained a reputation as a hard-tackling centre. However, he could more than competently fill in on the wing, at fly half and even at full back when required. He played regularly for Gloucestershire in the late forties and early fifties, including two County championship semi-finals. Roy Sutton was born in Columbia Street, a stone’s throw from the Kingsholm ground, on February 1, 1928 and never strayed far from the area known as Clapham all his life. One of eight children, his mother ran a fruit and vegetable store in the Kingsholm Road. He was educated at St Marks and at KingsholmSchool and left aged 14 to become a trainee electrician. He went on to spend the majority of his working life as an engineer with Dowty. 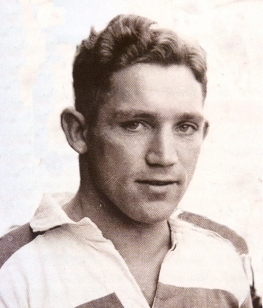 Roy played his early rugby for Coney Hill and Spartans before serving two years in the Royal Navy. He played in Navy trials and also played county rugby for Notts, Lincs and Derby, appearing for Gloucester United while home on leave. On returning to Gloucester he played in a record-breaking season for Coney Hill before rejoining Gloucester RFC late in the 1947-48 season and playing on the club’s South West tour in April 1948. On 11 December 1948, aged 20 and having only played a handful of games for Gloucester, he made his County Championship debut against Somerset at Bristol (both regular centres Ken Daniell and J V Smith were unavailable). Roy played 37 games for Gloucester that season, scoring 9 tries, and was now established in the 1st XV. He became a county regular for the next two years. 1950-51 was his outstanding season for the county. He began with two tries against Dorset and Wilts and continued with impressive performances against Cornwall and against Somerset at Bath where he scored a good try in the corner. Gloucestershire reached the semi-final in February and after playing in the 3-3 draw with East Midlands at Kingsholm, he played again in the replay at Northampton which was lost 6-0. He played for Gloucestershire against Somerset and Devon in October 1951, but then injury and loss of form caused him to lose his county and club places. He scored a try on his return against the RAF in March and kept his place for the rest of 1951-52, scoring a try in the victory over Teignmouth which secured the record number of victories in a season. The following season was spent largely with Gloucester United, but in 1953-54, under John Taylor’s captaincy, he regained his form, partnering Taylor in the centre and playing a major part in another record-breaking season for the club. In 1954-55 he regained his county place and played at centre for Gloucestershire with Taylor (who was now a Leicester player) throughout the county season. In and out of the side during the following two years, he played centre, wing or fly half as required. He had suffered a number of injury problems and in 1956-57 accepted the captaincy of Gloucester United, where he played full back in several games. A number of ex-players have commented on the support that he gave them as United captain, early in their careers. On retirement Roy Sutton joined the Gloucester committee where he served for a number of years. He died at Gloucester in October 2005.